The Honor Bar, owned by the Hillstone Group (owners of Houstons, Bandera, etc.) is a trendy/upscale bar with amazing food. 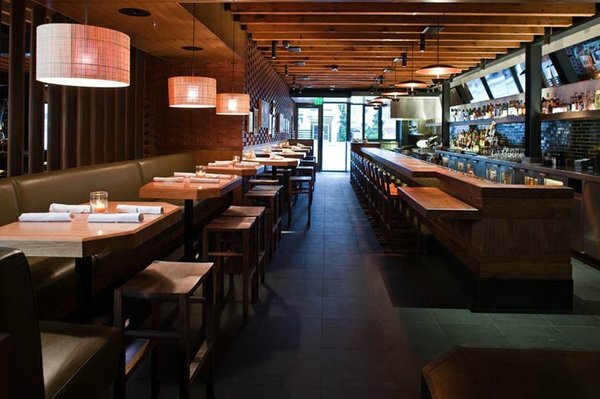 Located on South Beverly Drive, The Honor Bar is attached to the famous South Beverly Grill. While offering some of the same food as South Beverly Grill, The Honor Bar’s menu is a little more casual and has more comfort food. Everything we ordered was so amazing! Never in a million years would I think to order this, but it was SO good. Healthy and had so much flavor. These kind of dishes make eating healthy so easy. I loved the peanut vinagrette! I highly recommend! Light, fresh and delicious. It had a spicy kick to it too which I loved. Great roll! This was a damn good burger. Burgers are my specialty, and I give props to this one. It was unique because of the cabbage slaw and it was so saucy and juicy. I would totally order this again and again. Definitely a great burger in LA, highly recommend! Um literally, this was out of this world. Heaven! Everything about this was amazing. The arugula with the sauce, and the vinagrette slaw with the fried chicken and melted cheese…it was the perfect combination of flavors. This might have been my favorite thing ordered. It’s a must! The Honor Bar is very lively and they even have a live jazz band! It’s a great place for lunch, or dinner and drinks with friends after work. I loved all the food that we ordered there. I highly recommend this place. Ambiance is cool and it’s so delicious! AFTER DINNER AT THE HONOR BAR! thanks for the only good pix of the “Honor Burger” I’ve seen on the internets.